A Fundraising event for the Friends of the Mukwonago River to support the Mukwonago River watershed by means of education, preservation and restoration. 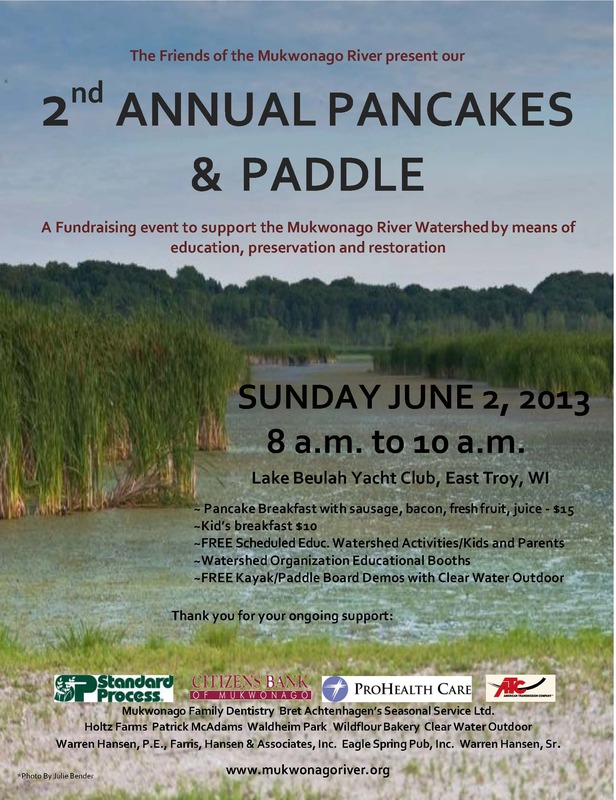 June 2, 2013 8:00 a.m.- 10:00 a.m. with our partners the Lake Beulah Yacht Club and the Lake Beulah Protective and Improvement Association. 6:00 a.m. Paddle for the hardy. Bring your own canoes, kayaks and gear. 8:30 a.m., 9:00 a.m, 9:30 a.m. Watershed Educational Activities with several local camps and schools. Fun learning experiences. 9:00 a.m.- 11;00 a.m. Kayak and paddle board demos with Clear Water Outdoor. Bring appropriate water gear. It is only June. 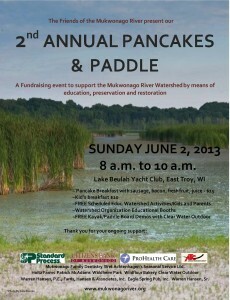 The Friends and our partner watershed organizations will be there with people, literature and information about our activities and roles in protecting the Mukwonago River watershed. Check Facebook for updates. Thank you for your donations and membership in the Friends of the Mukwonago River. Your support is vital to our work.